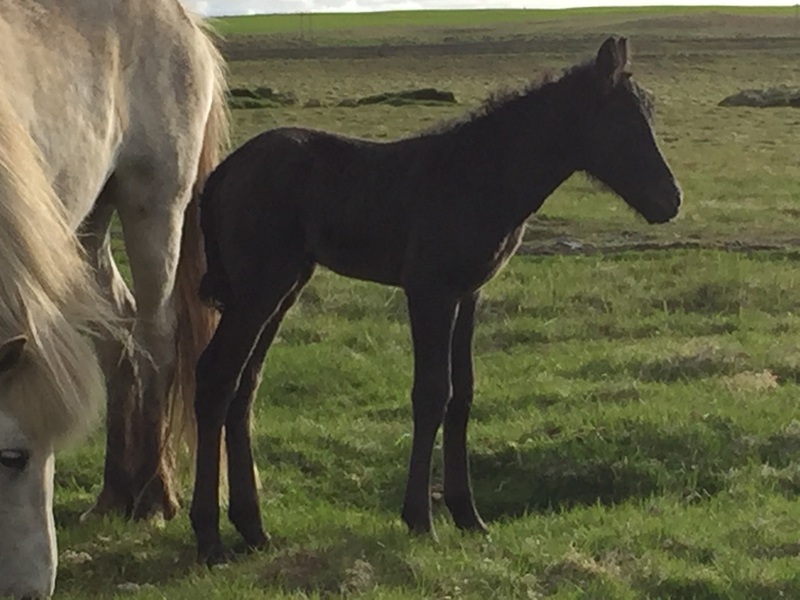 Hljómur frá Heimahaga is a beautiful black stallion foal, son of Konsert frá Korpu (8.61) and Hríma frá Svalbarðseyri. Hljómur was born on the 19th of June. Konsert frá Korpu (8.61) is a great, black stallion with 8.41 for Conformation and 8.75 for Rideability; 9 for tölt, 9 for trot, 8.5 for pace, 8.5 for gallop, 9 for spirit and 9 for general impression. Konsert has also 9 for slow tölt. 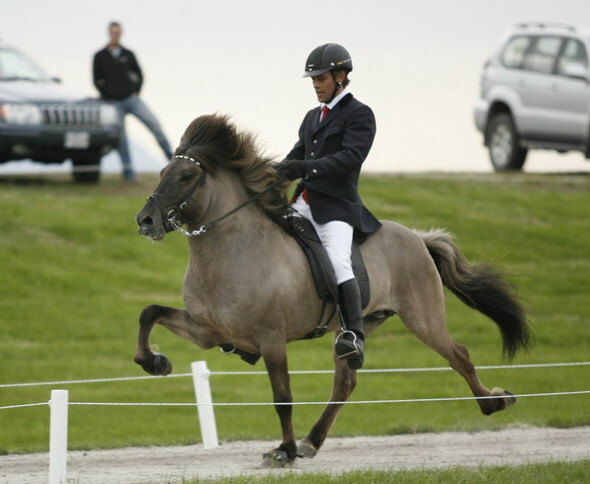 F: Sær frá Bakkakoti (8.62) has 7.96 for Conformation and 9.05 for Rideability; 9 for tölt, 9 for trot, 9 for pace, 8.5 for gallop, 9.5 for spirit, 9 general impression and 8.5 for walk. Sær has also 8.5 for slow tölt. Sir is a light blue dun stallion, he got 1. price for his offspring at LM2006 and honorary award for his offspring at LM2008. FM: Sæla frá Gerðum (8.11). 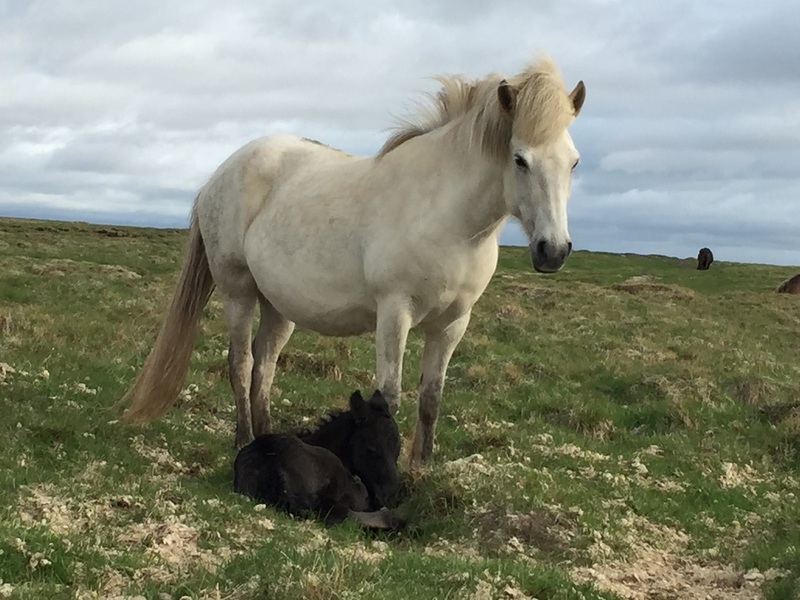 Sæla was a bay dun tobiano mare with 7.99 for Conformation and 8.23 for Rideability; 8.5 for tölt, 8 for trot, pace, gallop, temperament, character and 9 for general impression. 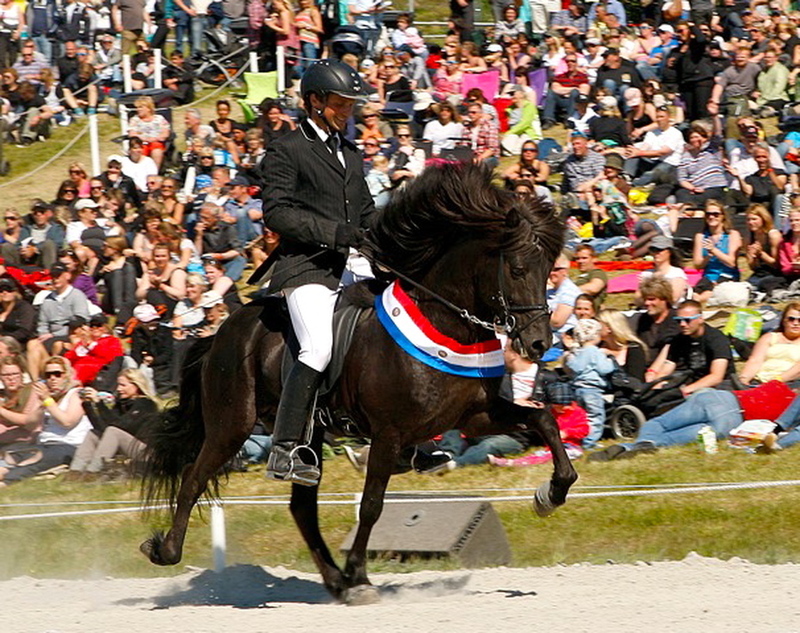 She was a daughter of the honoured stallion Ófeigur frá Flugumýri. M: Hátíð frá Hellu (8.03) has 7.93 for Conformation and 8.13 for Rideability; 8.5 for tölt, 8 for trot, 7.5 for pace, 7.5 for gallop, 8 for temperament, 8.5 for character and 8.5 for general impression. Hátíð is grey (born black) tobiano. 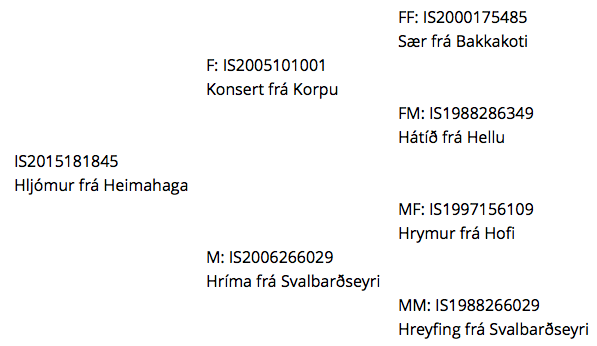 MF: Gáski frá Hofsstöðum (8.32). 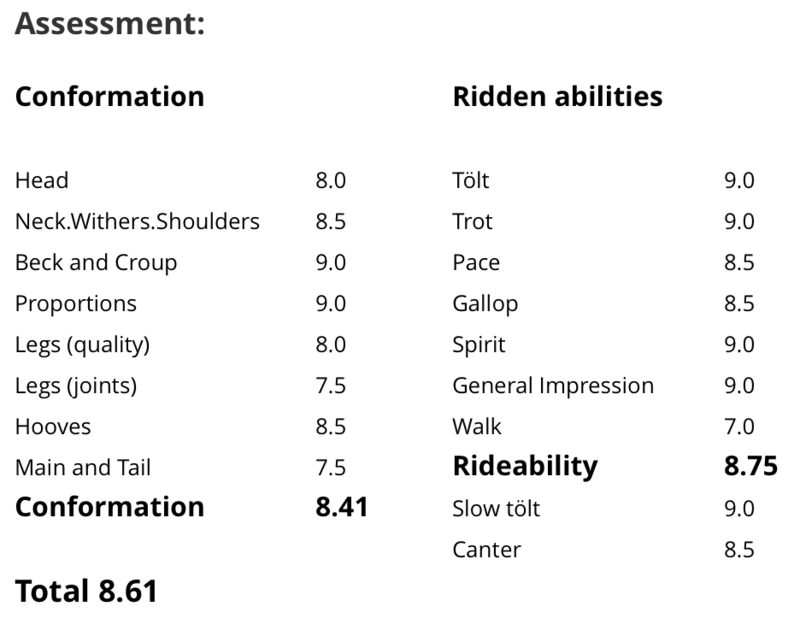 Gáski had 8.10 for Conformation and 8.53 for Rideability; 9 for tölt, 8.5 for trot and pace, 8 for gallop and 8.5 for temperament, character and general impression. Gáski was grey (born chestnut) tobiano, he got 1. price for his offspring at LM1986 and honorary award for his offspring at LM1990. MM: Freyja frá Hofsstöðum (7.98). Freyja was a chestnut tobiano mare with 7.89 for Conformation and 7.78 for Rideability; 8 for tölt and trot, 7 for pace, 7.5 for gallop and 8 for temperament, character and general impression. Hríma frá Svalbarðseyri, is daughter of Hrymur frá Hofi (8.20), and Hreyfing frá Svalbarðseyri. Hrymur is a four gaited stallion and has 8.16 for Conformation and 8.23 for Riding Abilities; 9 for tölt, 9 for trot, 9 for gallop, 8.5 for spirit, 9 for general impression and 6.5 for walk. Total 8.20.